Elon Musk might send rockets to space and be worth $20 billion, and but he still needs to go on Twitter to meet women. 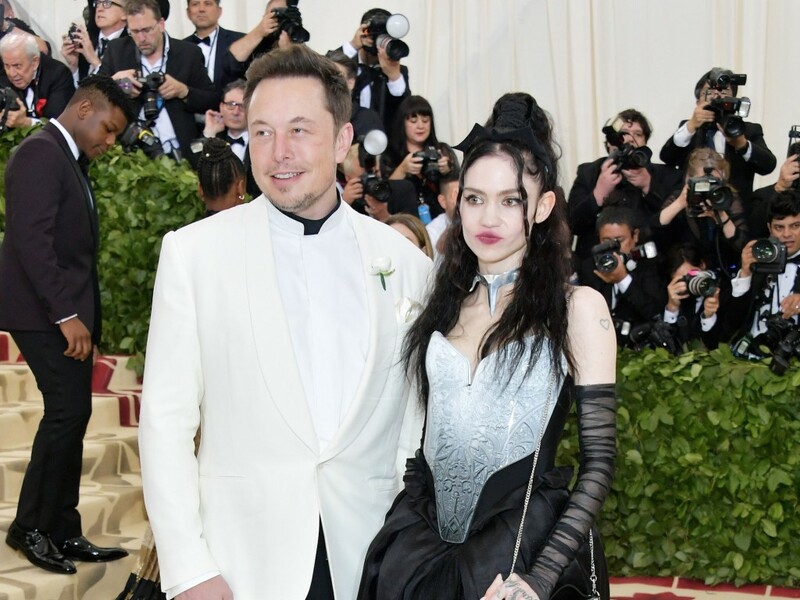 Elon Musk is dating Canadian musician Grimes after the pair had geeked out over an artificial intelligence joke on Twitter. 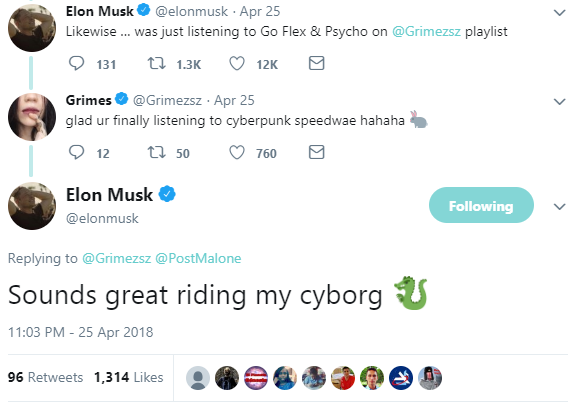 Musk had reportedly planned to make a joke around Roko’s Basilisk, a thought experiment about the dangers of developing artificial intelligence. Roko’s Basilisk says that because an all-powerful artificial intelligence from the future could retroactively punish those who did not help bring about its existence, it would be rational to side with people supporting the development of artificial intelligence. But he discovered that singer Grimes had made the exact same joke three years ago. 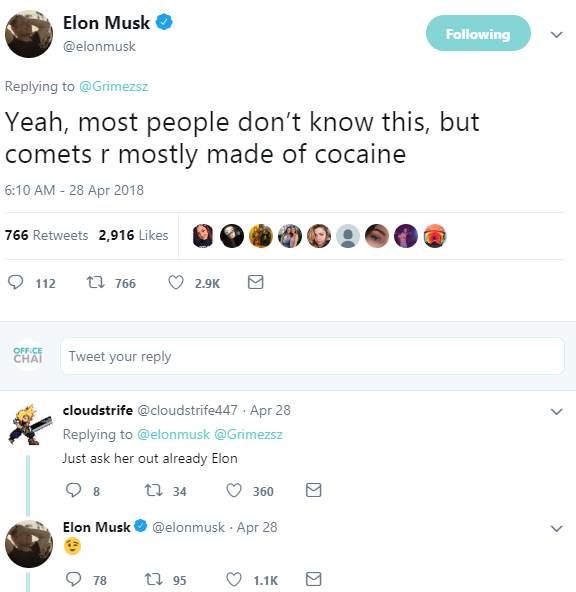 And just three days later, after Musk had shared a long-exposure photos of a comet, Grimes had joked saying “that’s a lot of cocaine,” to which Musk had with a “Yeah, most people don’t know this, but comets r made mostly of cocaine.” People had begun noticing the banter, with one commentator asking Elon to ask her out already, to which Musk had replied with a winky face. And it appears that Musk did ask her out — yesterday, Musk tweeted simply tweeted “Roccoo Basilisk” in an apparent sign of their relationship. Hours later, he appeared at the Met Gala with her by his side. 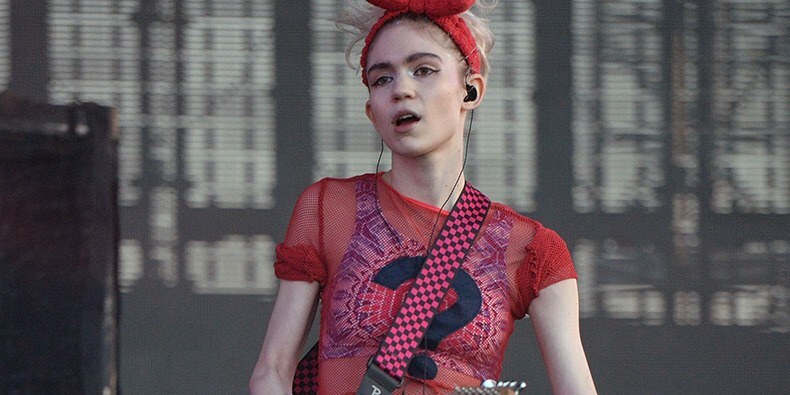 Grimes, whose real name is Claire Elise Boucher, is a critically acclaimed Canadian musician, songwriter, record producer and visual artist. Her third studio album Visions (2012) was hailed as “one of the most impressive albums of the year so far” by The New York Times, nominated for the Polaris Prize, and received the Juno Award for Electronic Album of the Year. The 30-year old also illustrates all the artwork in her albums, and her art is influenced by Japanese Manga and anime. She was a double major in psychology and philosophy, with minors in Russian and electro-acoustics before she dropped out of school to follow her music career. Musk, for his part, has been married thrice, and has five children. He was dating actress Amber Heard last year, even travelling with her to Australia with his kids, but the pair later split because of their conflicting schedules.